A high profile entertainment company came to ACCESS to help celebrate a major milestone. The direction was clear – this event had to blow their guests away. The purpose of the event was to increase company loyalty and build team camaraderie. The plan? Design an experience that would make attendees that were usually behind the scenes feel like Hollywood stars themselves. We transformed a 40,000 square foot tent into 5 mini “parties within parties.” Each section featured its own trending drinks, delicious food, thematic décor and lighting galore. Of course, a Hollywood-style step & repeat, sky trackers and “paparazzi” welcomed attendees at the entrance. One challenge was taking a single, massive tent, and creating unique, individual spaces within the space. Each themed section had its own localized entertainment featuring everything from costumed characters, flash mobs, stilted models, living sculptures and graffiti artists. 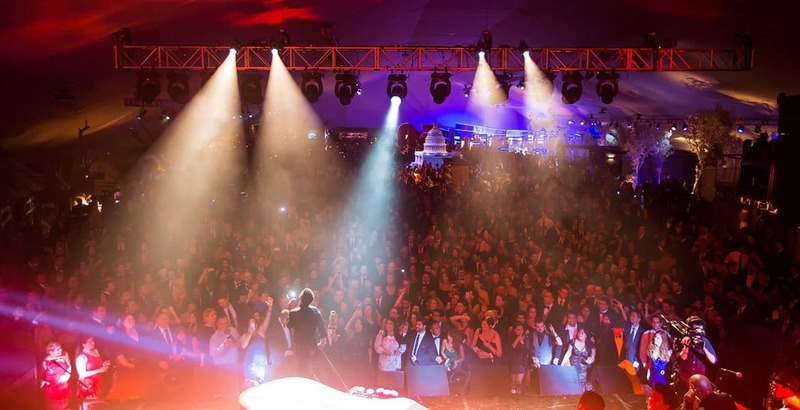 A-list celebrities Snoop Dogg, Robin Thicke, and Jared Leto entertained from the main stage. The event was called and “unrivaled success” and “an epic celebration” by our clients. We’ll high five to that.